More than one in three — an estimated 328,000 — Ontario students in grades seven to 12 report moderate-to-serious psychological distress, according to new survey results from the Centre for Addiction and Mental Health (CAMH). Girls are twice as likely as boys to experience psychological distress. “This is a significant number of young people, especially girls, who are experiencing high levels of psychological distress,” says Dr. Robert Mann, senior scientist at CAMH and co-lead investigator of the Ontario Student Drug Use and Health Survey (OSDUHS). A total of 10,426 students from across Ontario participated in the 2015 OSDUHS, the longest-running school survey of adolescents in Canada, and one of the longest-running surveys in the world. “We were also surprised to see this number increase to 34 per cent in 2015 from 24 per cent in 2013. That is a 10 per cent jump in reported psychological distress in just two years,” said Dr. Mann. Psychological distress is defined as symptoms of depression and anxiety and is measured using a six-item screening tool. Students are asked how often they felt nervous, hopeless or worthless, among others indicators, in the last four weeks. Forty-six per cent of girls indicated high levels of distress compared to 23 per cent of boys. Levels of distress also increase significantly in the later teens, to an average of over 40 per cent of students in grades 11 and 12. One in five students (21 per cent) reported visiting a mental health professional at least once during the last year, a marked increase from 12 per cent in 1999. Additionally, 86 per cent of students visit social media sites daily and about 16 per cent spend five hours or more on social media per day. An estimated 122,600 students in Ontario (13 per cent) report symptoms of a video gaming problem which includes preoccupation, loss of control, withdrawal and disregard for consequences. The percentage of students indicating a video gaming problem rose to 13 per cent in 2015 from 9 per cent in 2007, the first year of monitoring. Problem video gaming is especially prevalent among boys in this age group, with 20 per cent reporting problematic symptoms compared with 5 per cent of girls. 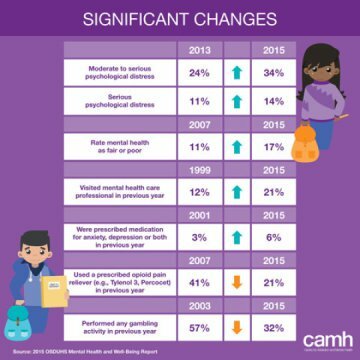 Noticing an increase in young people struggling with gaming and other forms of tech use, Pont helped develop CAMH’s clinical programming on technology misuse and also trains other health professionals in this emerging area. Web Source: Centre for Addiction and Mental Health.